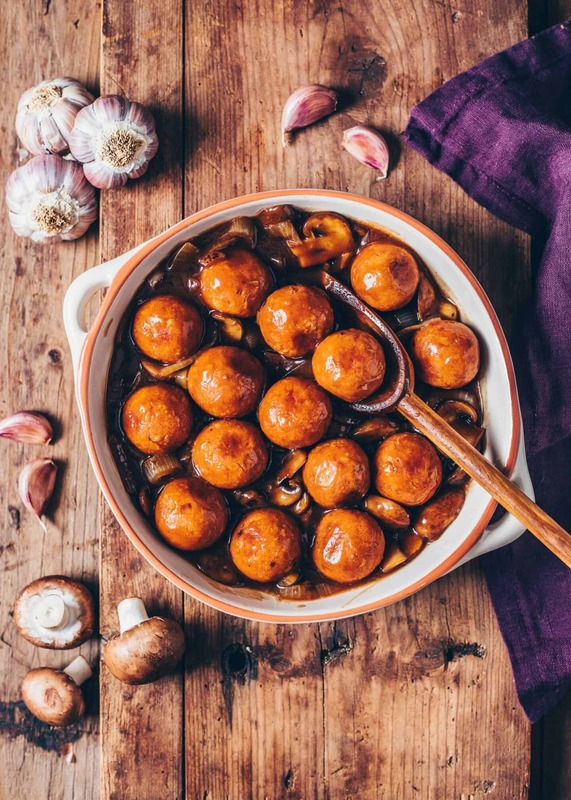 These easy to make No-Meat Balls (Vegan Meatballs) are the ultimate comfort food! 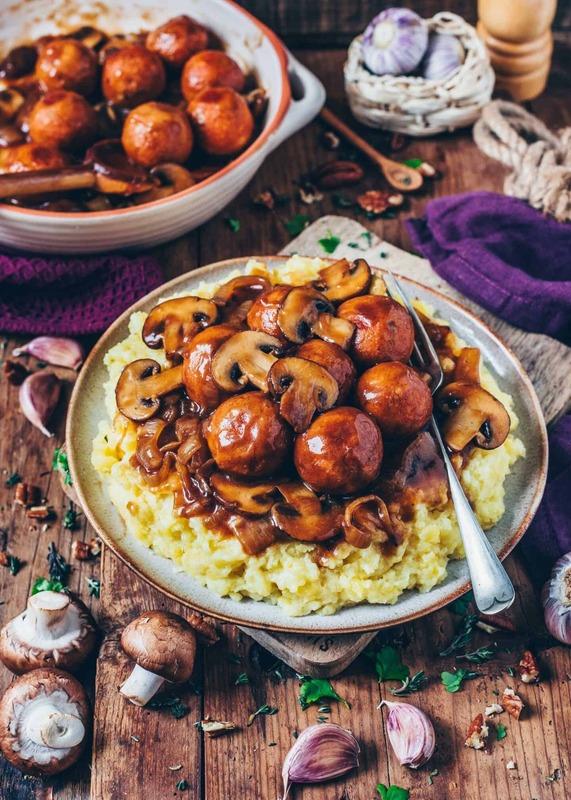 Serve them over Mashed Potatoes and drench them in Mushroom Gravy for a perfect Christmas dinner or any time! 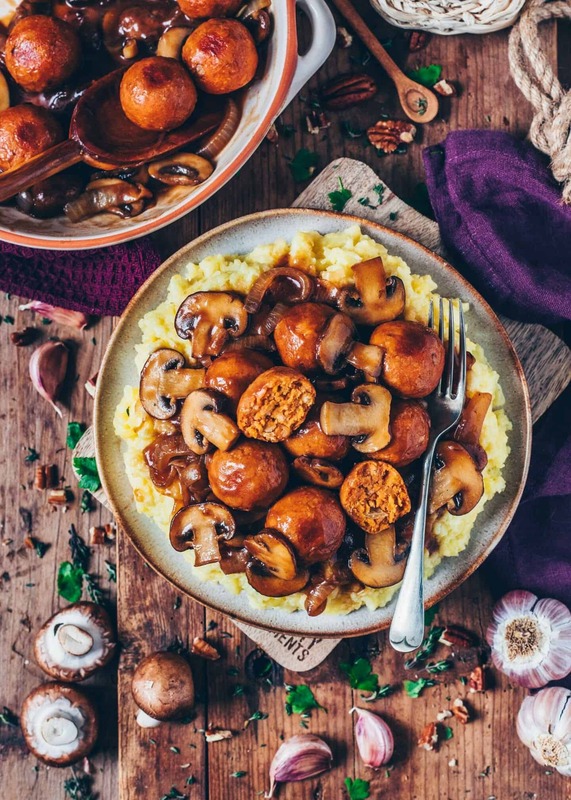 If you’re still looking for a delicious vegan main dish that is sure to be a hit at your dinner table, look no further! 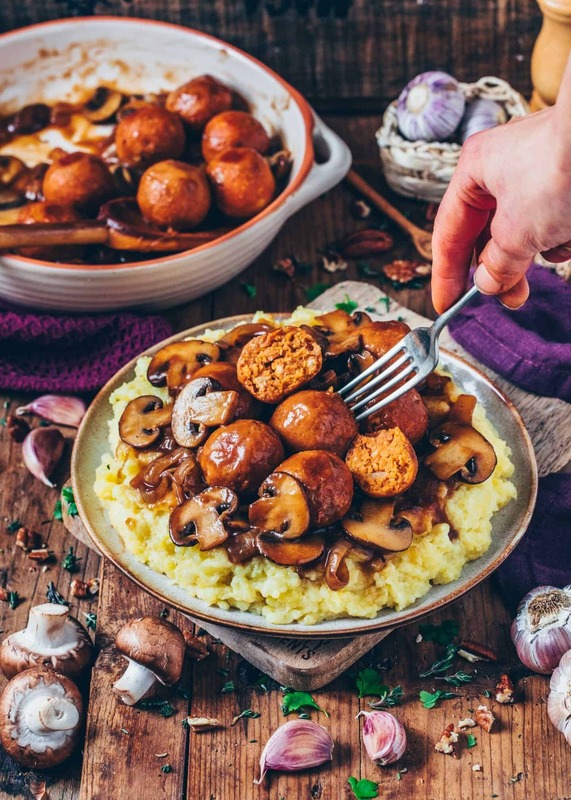 These Vegan No-Meat Balls are not only perfect for Thanksgiving or Christmas but also for any day that you’re in need of a cozy and satisfying comfort meal. They’re made from chickpeas and loaded with spices, also, roasted onions and garlic which add amazing flavors. 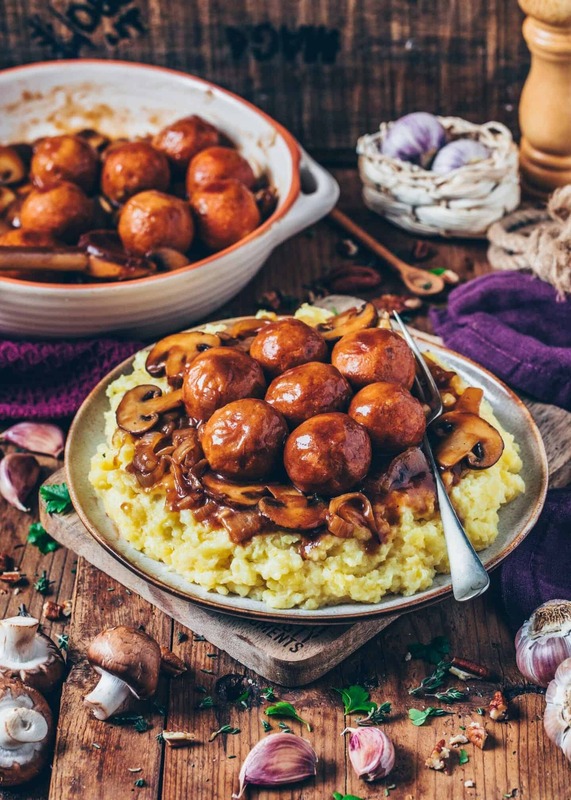 Furthermore, when you serve these meatless meatballs with Vegan Gravy over Mashed Potatoes, they make a hearty plant-based feast that is even better than traditional meatballs. Actually, I‘ve been making these No-Meat Balls for years, and it’s also one of the first vegan recipes of mine that I’ve ever shared next to Vegan Falafel. I’ve already tried different variations, changing a few things here and there to create a recipe that tastes the best to me. Anyways, I’ve discovered that it’s always really similar and very versatile. So you can it switch up, and/or add more ingredients to your liking. Above all, it’s about the perfect texture, so they shouldn’t be too wet or too dry, but meaty and delicious! For these Vegan Meatballs, there are basically only 2 ingredients required – Chickpeas (or beans) and grains, such as (gluten-free) breadcrumbs or oats. 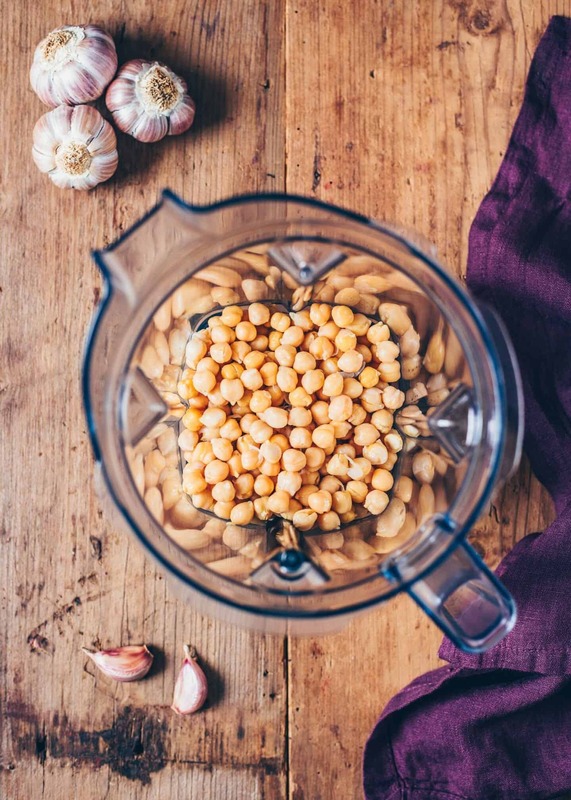 For this recipe I decided to go with chickpeas, however, I usually use beans, such as kidney beans, black beans or white beans. Anyways, you can use whatever beans or chickpeas you have on hand. Furthermore, I like to add a flaxseed egg for better binding, however, it will also work without it. Also, I always add onions, garlic, and some spices to make them flavorful. 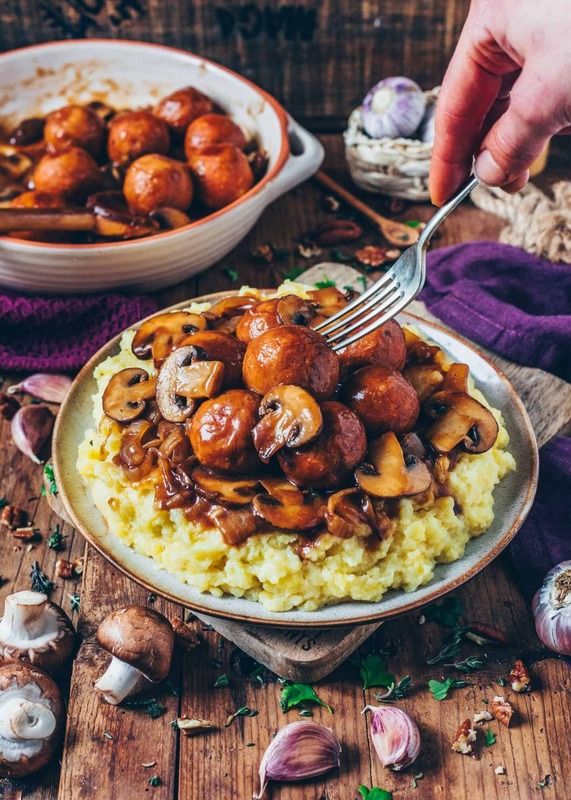 If you’d like to add some Mushrooms for an extra meaty texture, check out my recipe for Vegan Mushroom Meatballs. 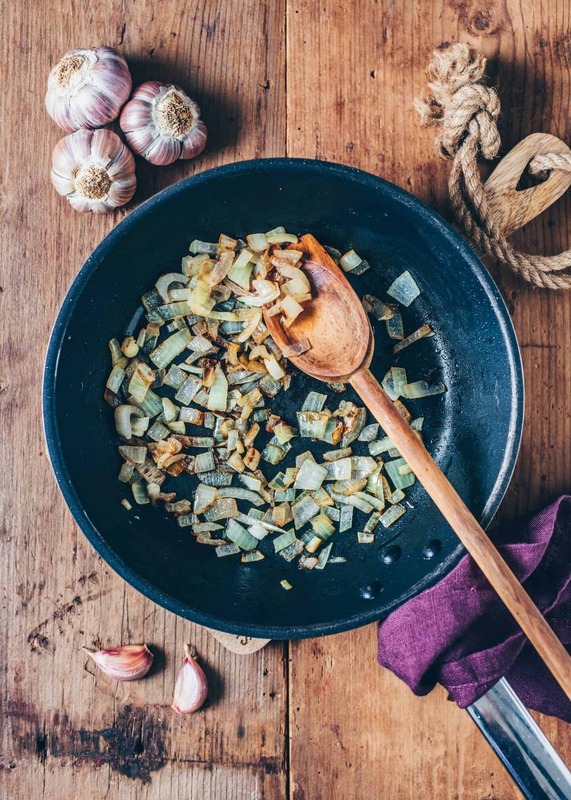 To make these meatless meatballs the first step is to start by sautéing the onions and garlic in a pan to build flavors. 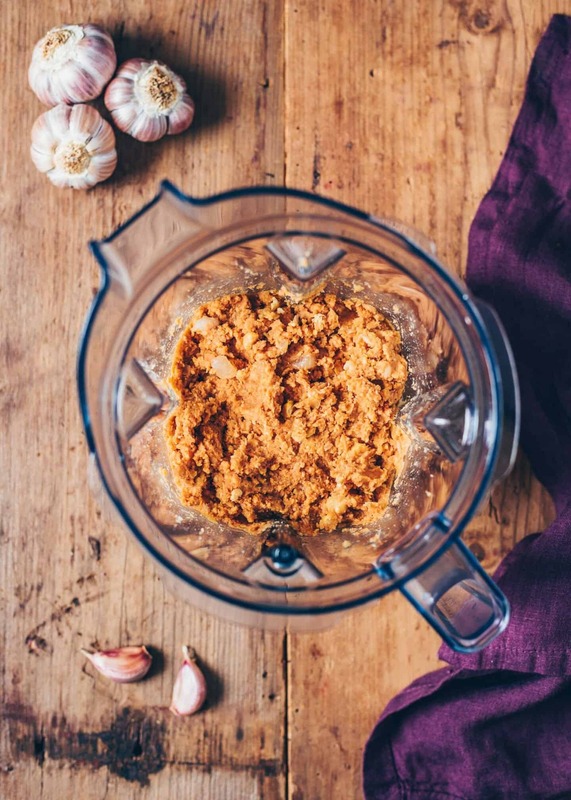 Then secondly, add all the remaining ingredients for the Vegan Meatballs into the food processor or blender and pulse until combined. Then, form the mixture into balls, brush them with a little oil and bake in the oven for about 20-30 minutes. Optionally, you could also fry them in a pan on all sides until lightly browned before going into the oven. 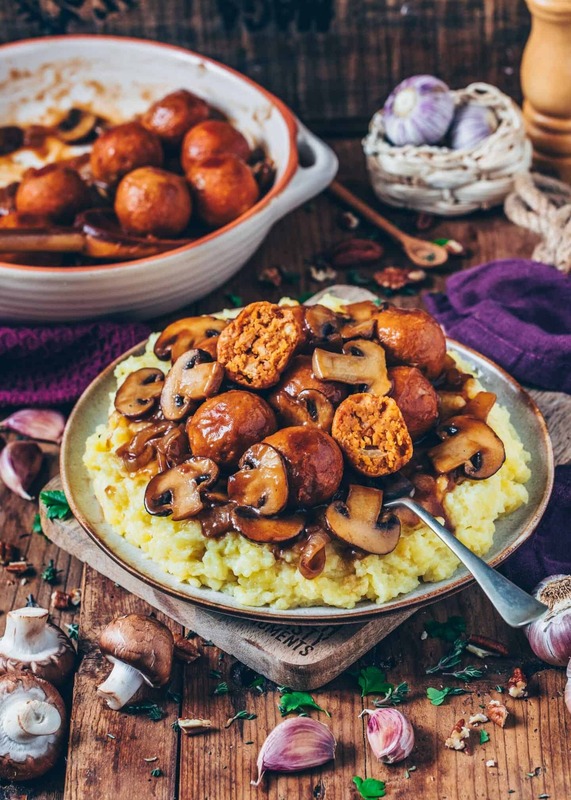 While your No-Meat Balls are baking, you can boil the potatoes for the Mashed Potatoes and prepare the Mushroom Gravy. 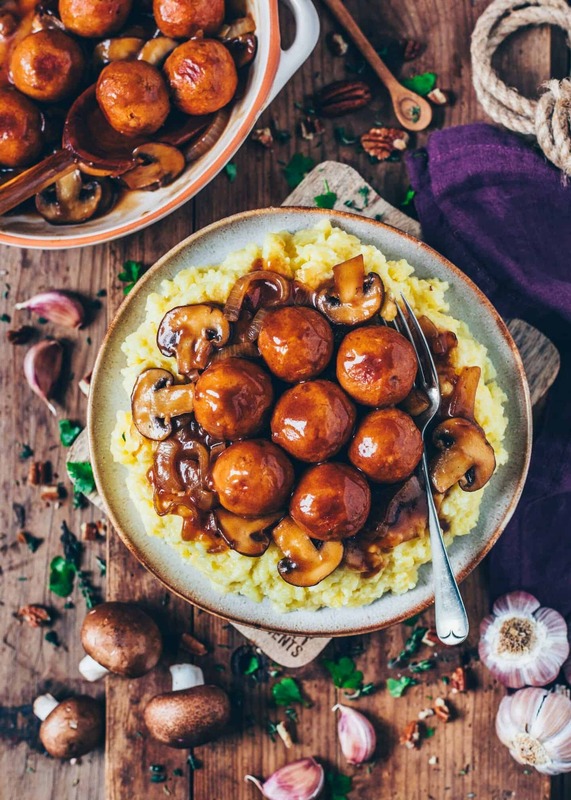 Of course, you can serve this dish without the sauce, but let’s be honest, Potatoes and Vegan Meatballs aren’t quite the same without it, are they? 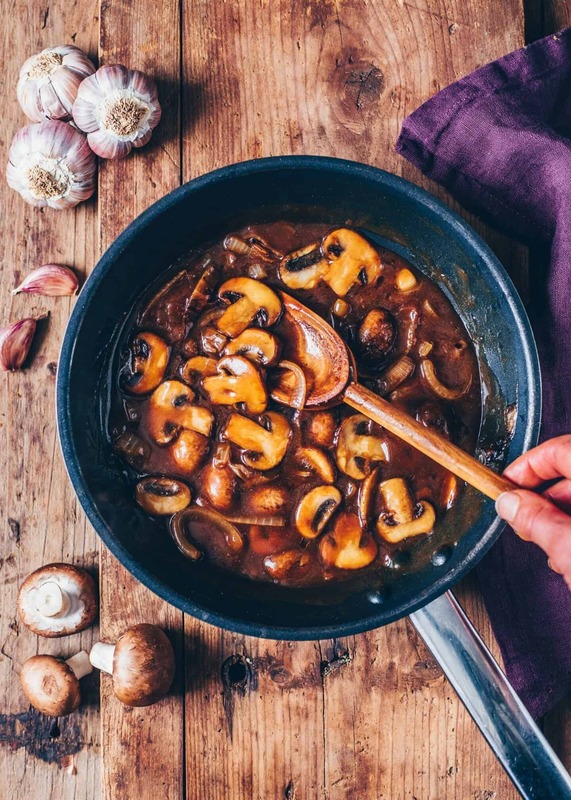 This Vegan Gravy is healthier than traditional gravy, so you can eat it without regrets. It also includes mushrooms which makes it more flavorful and special. If you’re not such a big mushroom fan like me, you can simply omit them. 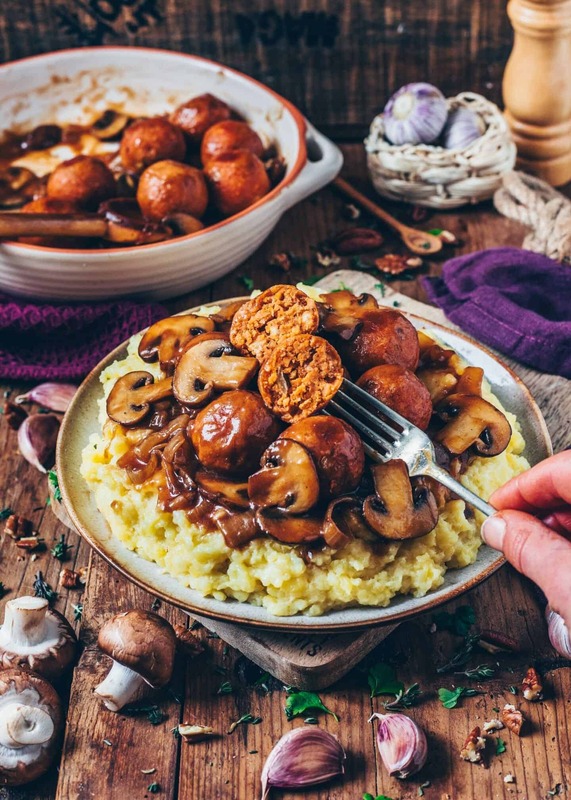 The perfect vegan comfort food! 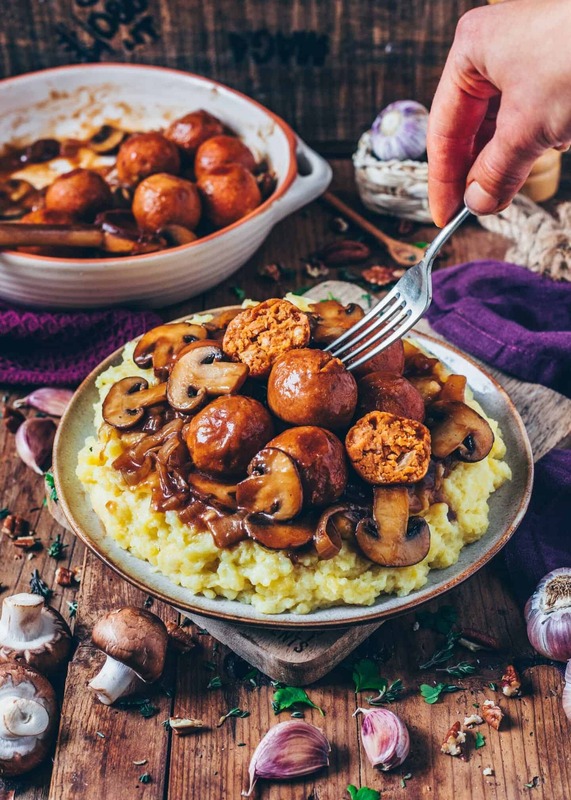 These easy to make Vegan Meatballs are the ultimate comfort food! Serve them over Mashed Potatoes and drenched in Mushroom Gravy for a perfect Christmas dinner or any time! Preheat the oven to 400°F (180°C). Prepare the flaxseed egg by stirring 1 tbsp ground flaxseeds into 2,5 tbsp hot water. Allow to sit for 5 minutes. Heat oil in a pan and sauté onions for about 2-3 minutes until lightly browned. Then place with all remaining ingredients for the meatballs into a food processor or blender. Pulse until well chopped and combined, scrape down the sides in between. Form the mixture into 15 balls (it's easier with wet hands) and arrange on a baking sheet lined with parchment paper. Brush the balls with a little oil and bake for about 20-30 minutes, or until lightly browned, flipping through after every 10 minutes. Cut potatoes in quarters and cook in salted water until fork-tender, about 20 minutes. Then drain, return the potatoes back to the pot. Add the butter and mash with a potato masher. 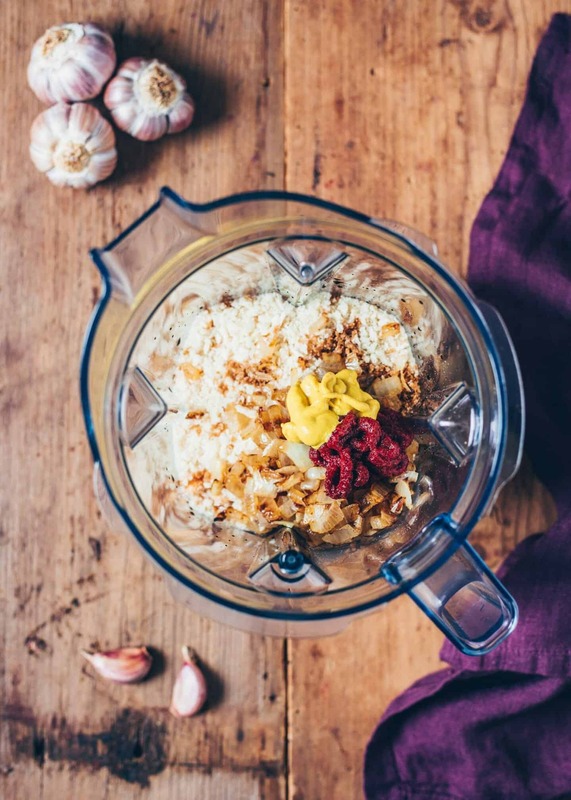 Stir in the plant-based milk to your desired texture and season with salt and pepper to taste. Heat the oil (or vegan butter) in a large pan over medium heat. Add the onions and mushrooms and sauté for about 5 minutes until browned, stirring occasionally. Add garlic and roast for a further minute. In a jar, mix the flour (or cornstarch), soy sauce and mustard with a bit of the vegetable broth until smooth, so there are no lumps from the flour anymore. Then add the flour mixture to the pan along with the remaining vegetable broth. Stir constantly and bring to the boil. Reduce the heat and let simmer until it thickens up to your desired consistency, about 5 minutes. (The longer you cook, the more it thickens). Season with thyme, salt, and pepper to taste. Refine with coconut milk if you like. Add the no-meat balls to the gravy and stir to coat. While the no-meat balls bake, you can cook the potatoes and prepare the gravy, so your meal is ready faster! You can use any (gluten-free) breadcrumbs but you'll get the best texture when using panko breadcrumbs. I love vegan meatballs! Yours look so delicious. And the gravy looks super tasty as well. I made this recipe for New Year Eve and everybody like it ! We love mashrooms and the falafels was really good ! This recipe is perfect, but with more sauce it will have be more yummy. I will do it again, thanks for the recipe Bianca ! 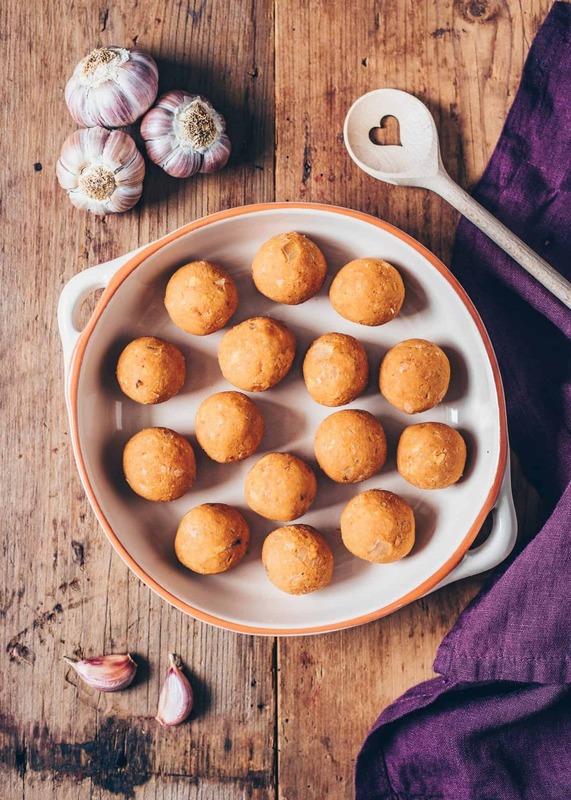 Would love to make these no-meat meatballs and wanted to ask if can substitute panko breadcrumbs to cornflakes – due wheat intolerance. yes sure, you can do that! I made this tonight for dinner. I used store bought no-meat balls because I had them on hand, but I’ve got to say this is the best mushroom gravy I’ve every made. It will definitely become my go-to recipe. Thanks! Followed this recipe exactly and it was amazing!!! Made it three times already and can’t get enough. Delicious!